We’re committed to being more than just a bandaid for families facing the financial burden of cancer. That’s why we’re always looking for ways we can do more, dig deeper and maximize our impact. We’ve learned over the years that the best way to do that is through collaboration. On September 28, 2017, Family Reach hosted its second annual Imagine Session. 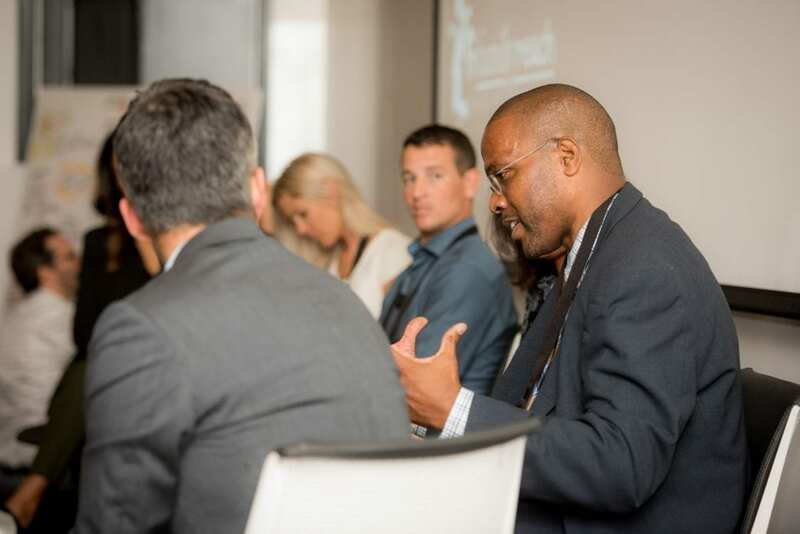 Leaders from across the country and across sectors united to listen, learn and brainstorm innovative ways to address cancer-related financial toxicity (CRFT) from a multitude of angles – transportation, food, housing and beyond – and fill a gap that few are addressing. 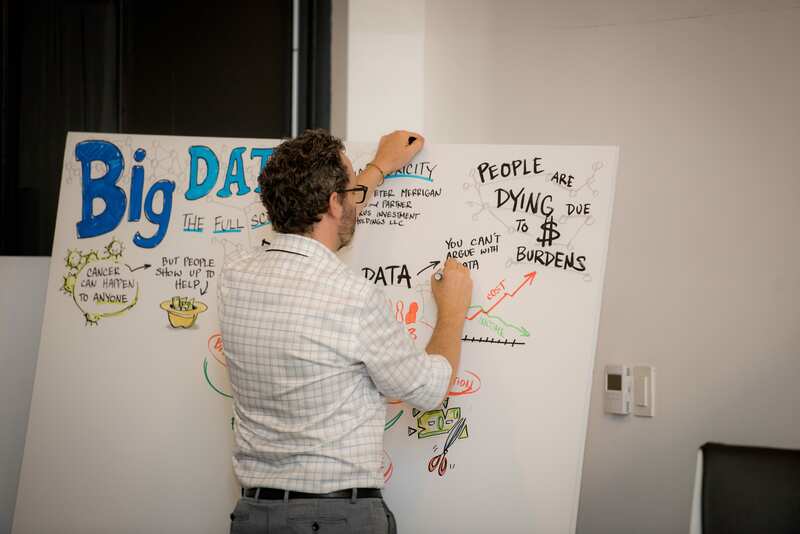 Moderated by Mario Muredda, President of our probono partner Harrison & Star, and animated by Matt Sullivan, a graphic facilitator from Collective Next, the day led to many dynamic discussions. 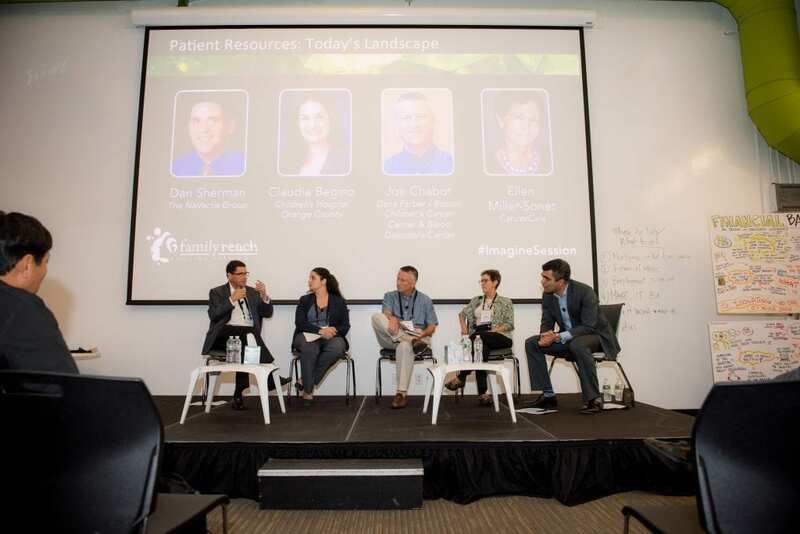 View Imagine Session 2017 Meeting Summary. 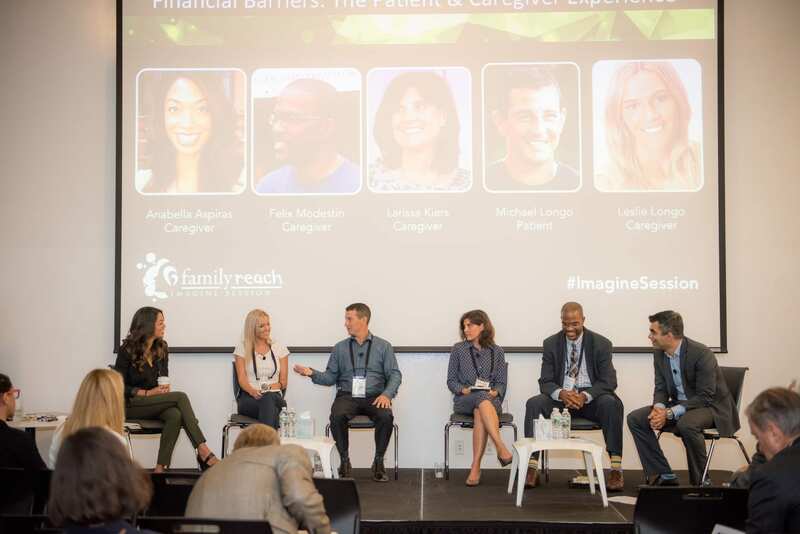 Annabella Aspiras, Leslie and Michael Longo, Larissa Kiers and Felix Medestin joined us on stage to provide an inside look at the financial struggles they have endured as cancer patients and caregivers. The group expressed feelings of isolation, fear, confusion and frustration spurred by lack of information and direct support surrounding CRFT. Filling gaps in policy, hospital staffing and financial education were all identified as possible starting points for broader solutions. Peter Merrigan (CEO and Partner, Taurus Investment Holdings LLC), outlined the research and data currently available surrounding CRFT. He discussed what CRFT means for a patient, the occurrence of CRFT in pediatric and adult cancer populations and its clinical impact. The presentation emphasized the need for more research and collaboration between the public and private sectors. Dan Sherman (Founder, The NaVectis Group), Claudia Begino, (Licensed Clinical Social Worker, Children’s Hospital Orange County), Joe Chabot (Pediatric Resource Program Director, Dana Farber/Boston Children’s Cancer and Blood Disorders Center) and Ellen Miller-Sonet (Chief Strategy and Mission Alliance Officer, CancerCare) discussed the current state of patient resources during our third panel of the day. 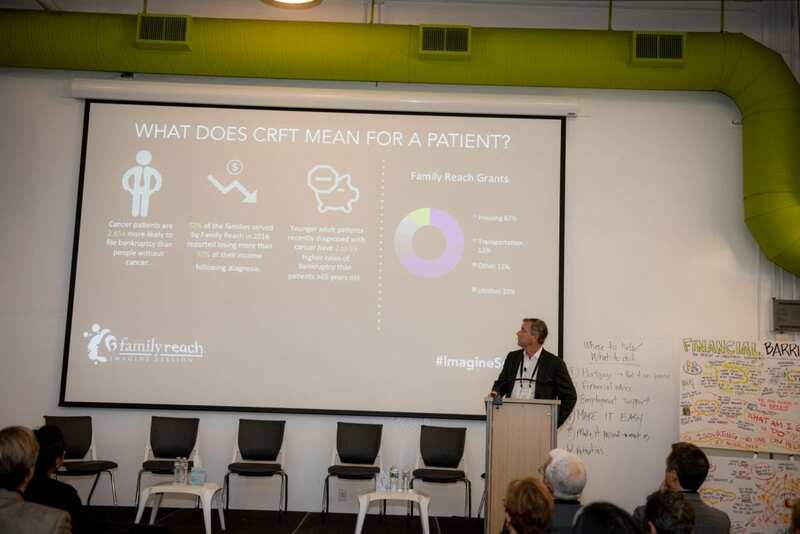 They highlighted the stigma of discussing personal finances and the lack of communication between healthcare professionals and patients as leading barriers to identifying families at risk of CRFT. All presenters agreed that we need more systems in place for spotting financial distress early on. 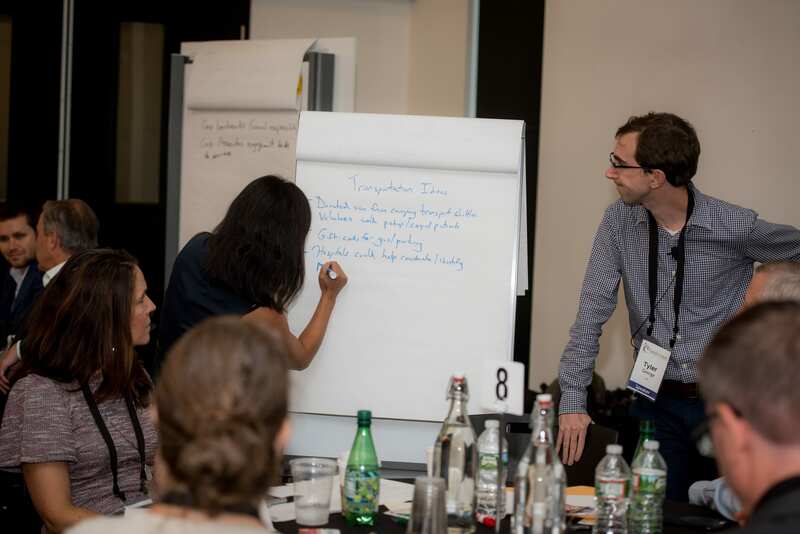 Attendees broke into small groups during our afternoon brainstorming session. They stepped into the shoes of the Watsons, a middle class family, and followed them as they received the devastating news that their young daughter had cancer. 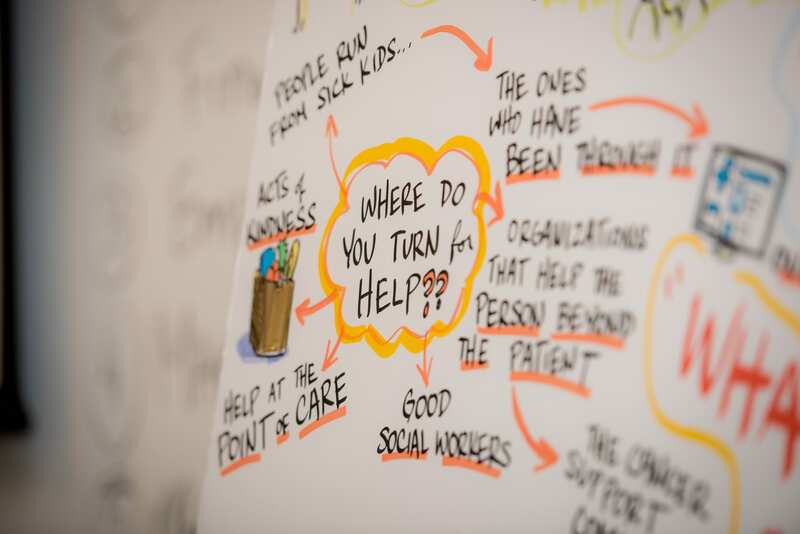 Groups navigated the many financial hurdles that arose – loss of income, extensive travel to treatment and unexpected out-of-pocket medical costs – and brainstormed possible solutions. The last panel of the day tied it all together. 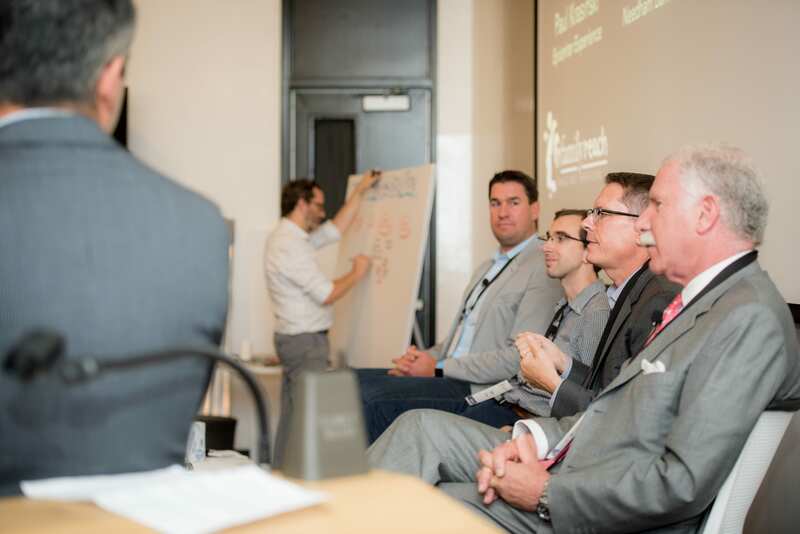 Paul Krasinksi (CEO/Founder of Epicenter Experience), Tyler George (General Manager, Lyft New England), Jon Dauphine (Executive Director, Foundation for Financial Planing) and Eric Morse (Executive Vice President, Needham Bank) described how sectors must unite to solve this large-scale social problem. 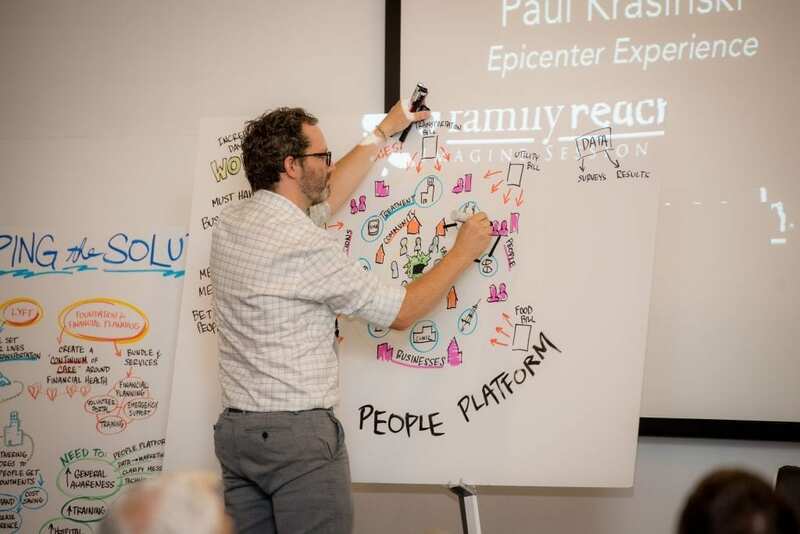 They discussed the idea of a “People Platform” with technology serving as the hub that connects stakeholders within each industry and protects cancer patients from slipping through the cracks of financial ruin. 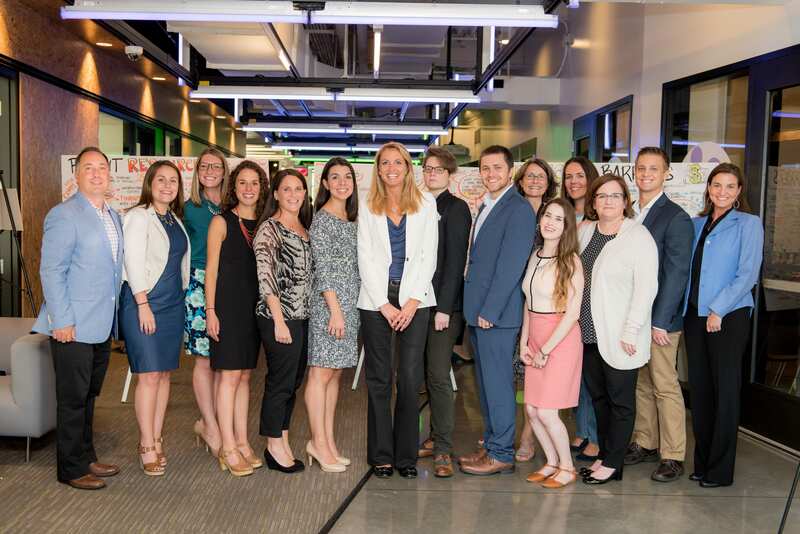 Family Reach staff from left to right: Brian Morello, Jackie Lake, Christina McCarthy, Lauren Mello, Laura Tirrell, Rosie Cunningham, Carla Tardif, Alex Lewis, Corey Fick, Rebecca Lobb, Maggie Dobbins, Jennifer Lorencovitz, Susan Marshall, Adam Heidbreder, Nicole Ackerman. Imagine could not have been possible without our sponsors, Astellas, Epicenter Experience, Harrison and Star, Janssen Pharmaceuticals, Kite Pharma, District Hall, The Castle Group, Takeda Pharmaceutical Company and Collective Next. 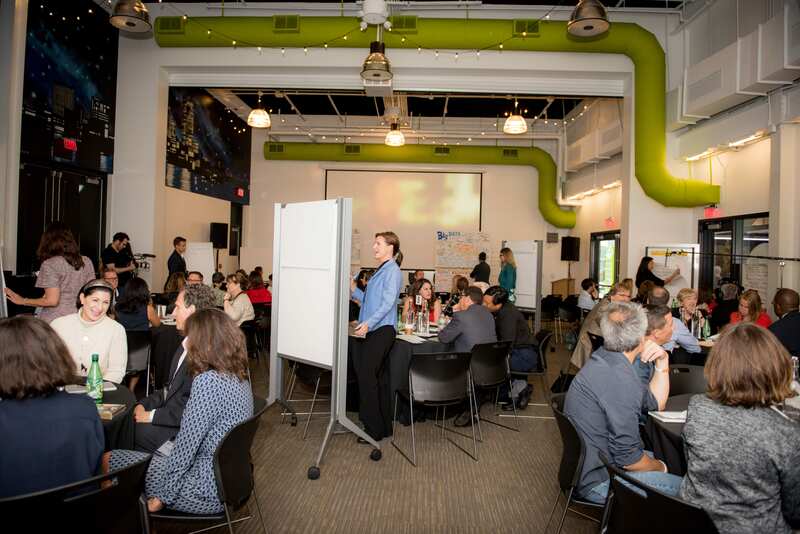 Through their support, the event produced out-of-the-box solutions for building awareness of CRFT and alleviating hurdles within several pillars – awareness, transportation, housing and food. We are excited to engage our stakeholders to take action and work with us to bring many of these solutions to fruition. Interested in helping us develop solutions within each pillar? Contact Rosie Cunningham, Family Reach Director of Marketing & Partnerships, at rcunningham@familyreach.org.